Have you given any thought to backing-up your LinkedIn contacts? I hadn't, until recently. Last week, I received a LinkedIn invitation to connect with Liana Evans [see Liana Evans Blends Social Media & Search For Greater Marketing Impact]. I really like Liana, so I was delighted to connect. At the same time, I was surprised that I hadn't already connected with her. Liana explained that her LinkedIn account had been hacked. She had successfully re-established her LinkedIn account, but every single contact had been wiped out! Oh, my - did that ever get my attention! I realized that I've never backed up my contacts. For that matter, I'd never given it a thought. Perhaps you haven't either - and you may be inspired to do so if I show you how. 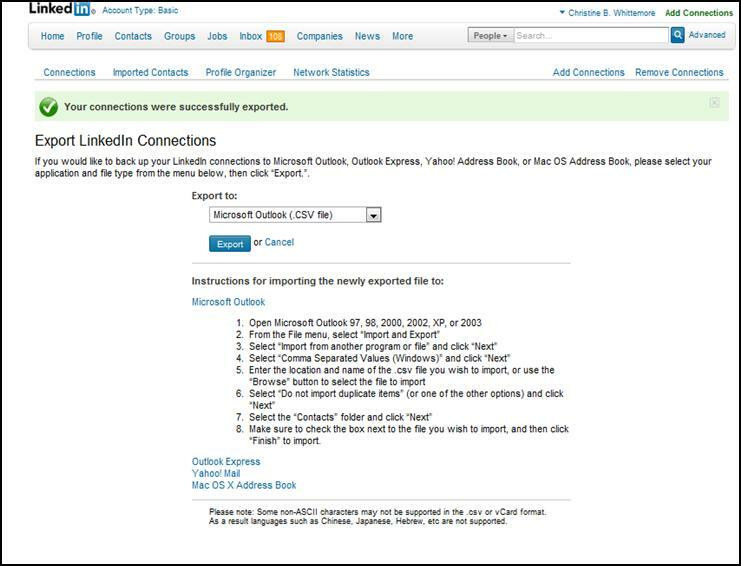 Consequently, here are the steps for backing up your LinkedIn contacts. 1. In your LinkedIn profile, go to Contacts. You'll notice in the bottom, right hand corner a clickable option to "Export connections". Click on "Export connections". 2. You will be taken to a new page focused on Exporting your LinkedIn connections. 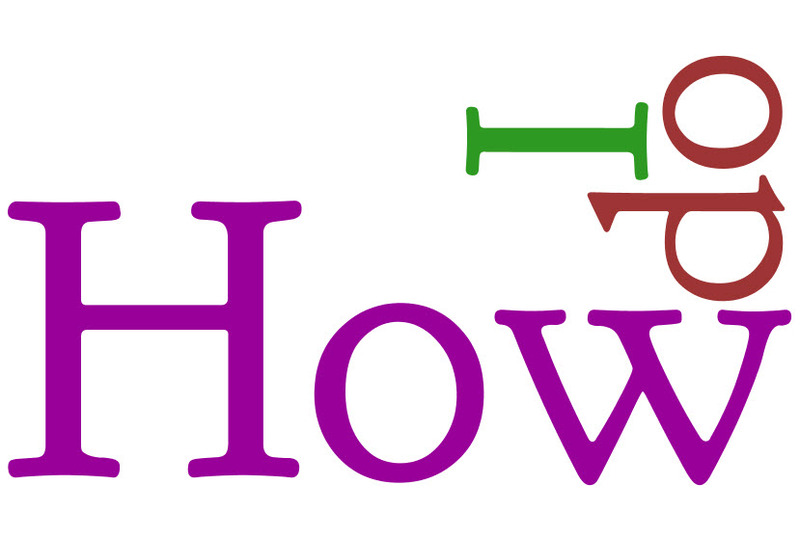 You have several format options including Microsoft Outlook (.csv file), Outlook Express (.csv file), Yahoo! Mail (.csv file), MAC OS X Address Book (.vcf file) and vCard (.vcf file). Pick the format that's right for you. I chose Microsoft Outlook. 3. I went through a security verification process. 4. I saved the file, adding "Nov11" to the filename and changing the destination folder. 5. Success per the confirmation message! Note the expanded directions for importing my LinkedIn contacts into Outlook. You'll be able to open the .csv file to double-check the contents of the file. 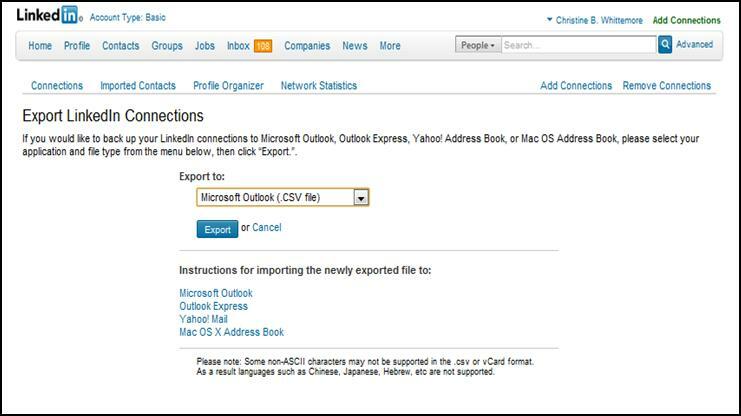 With minor changes, you can import the .csv file with your LinkedIn connections into other applications such as an email program or a CRM application like salesforce.com. 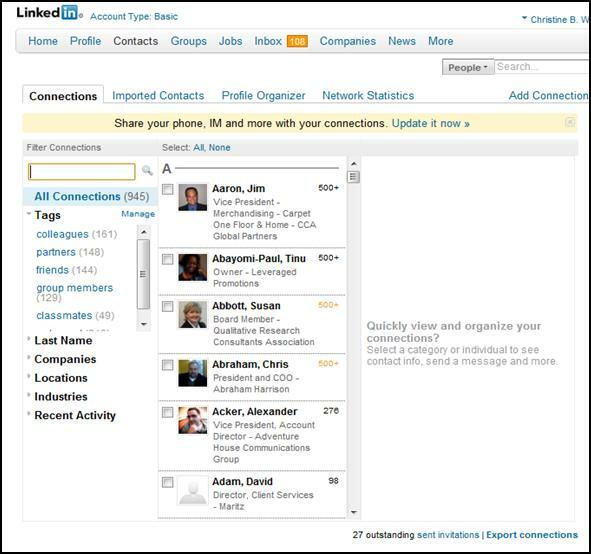 Have you backed up your LinkedIn contacts? How have you used the file generated? Any watchouts?